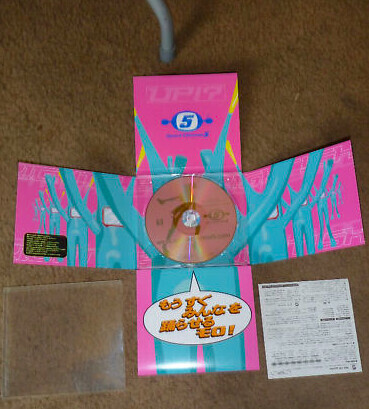 I have this promotional release of Space Channel 5, it has "promotion rom" on a side of the package. The package is a weird multi-unfold item that I managed to find online. Not sure why the picture referenced below is mostly pink as mine is mostly orange in color. I'll look into scanning the case and disk, though the case will be difficult for sure. Actually I was aware of this as I have collected some pictures of it during my online adventures. Attaching the pictures I have found, as they are decent quality. It appears to have been released in both pink and orange, not totally sure if the disc is the same as resolution of the pic doesn't allow for a clear view of codes etc, but looks pretty much similar to me.